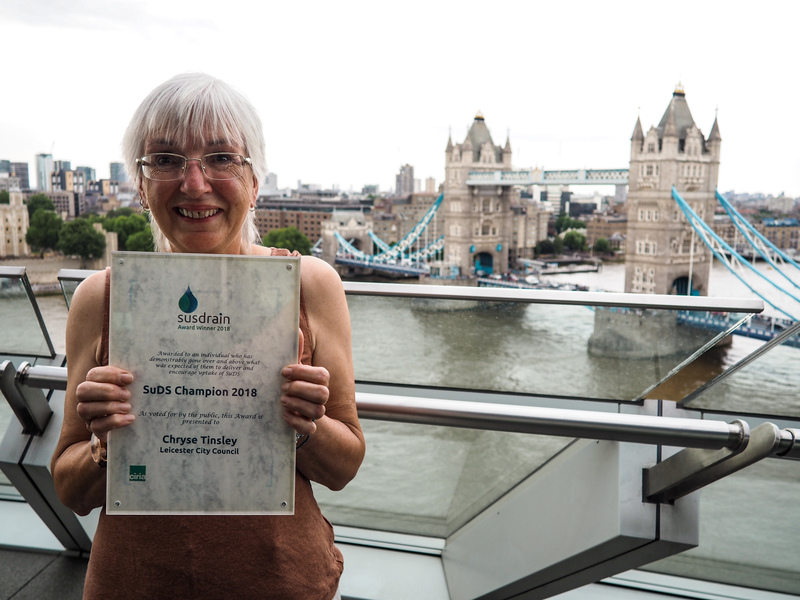 More than 100 guests gathered in London’s iconic City Hall Living Room on Wednesday 18 July 2018 to celebrate the inaugural susdrain SuDS Awards, supported by the Greater London Authority. Well-deserved winners were announced in three different categories, along with susdrain’s overall winner and our SuDS Champion as voted for by industry! Established and led by susdrain (www.susdrain.org), the awards showcase and recognise those delivering high quality sustainable drainage systems (SuDS) and attracted over 40 case study entries from across the UK. Attendees were treated to an impassioned call for rewilding of our urban areas by keynote speaker Theo Thomas, the London Waterkeeper. A summary from the Awards Chair, Andrew Eden, Environment Agency, left the audience with three key messages; strive for beauty, engage with stakeholders early, and consider communities and what will benefit them. Commenting on their win, Sheffield City Council’s Principal Landscape Architect, Zac Tudor said; “It’s great that Sheffield has been recognised for our ambitious and creative thinking behind the design of our new public places. Designers need to think wider than just a space looking good - spaces need to function for the future, building in climate change resilience and making landscapes work harder by providing multiple benefits. This includes creating places and settings to encourage regeneration, sustainable water management, biodiversity, and helping to reduce our city’s heat island effect but, most importantly of all helping us achieve a greater sense of wellbeing." Chryse Tinsley, SuDS Awards Champion said,“Winning this award is really important for me and Leicester City Council; it recognises our work and also reinforces our intent to do more and better SuDS for the city." The Awards category shortlists and full entries are available at www.susdrain.org. Huge congratulations to all our winners, those that were highly commended and commended and of course thanks to everyone who entered this year.